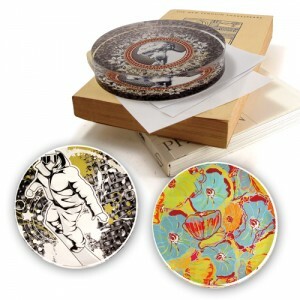 Paper Weights – check out our new range of paper weights. Custom printed Paper Weights are round or square with your design in full colour. Paper Weights have a velvet backing to prevent scratching. Paperweights make an ideal promotional gift and keeps your advertising message in front of your client at all times. Minimum order as low as 10 units. Available in two shapes – round or square. Decorative glass or acrylic paperweights fit easily into the hand and are actually meant to be handled and viewed from various directions through the dome, which acts like a lens to make the design change in its appearance with its movements in an attractive way. Antique paperweights were made in the “classic” years between 1845 and 1860 primarily in three French factories named Baccarat, St. Louis, and Clichy. Together with inventor Justin Schubert of a neighbouring town, they made between 15,000 to 25,000 weights in the classic period. Weights (mainly of lesser quality) were also made in the United States, United Kingdom, and elsewhere, though Bacchus (UK) and New England Glass Company (US) produced some that equaled the best of the French. Modern weights have been made from about 1950 to the present. In the US, Charles Kaziun started in 1940 to produce buttons, paperweights, inkwells and other bottles, using lamp-work of elegant simplicity. In Scotland, the pioneering work of Paul Ysart from the 1930s onward preceded a new generation of artists such as William Manson, Peter McDougall, Peter Holmes and John Deacons. A further impetus to reviving interest in paperweights was the publication of Evangiline Bergstrom’s book, Old Glass Paperweights, the first of a new genre. A number of small studios appeared in the middle 20th century, particularly in the US. These may have several to some dozens of workers with various levels of skill cooperating to produce their own distinctive “line”. Notable examples are Lundberg Studios, Orient and Flume, Correia Art Glass, St.Clair, Lotton, and Parabelle Glass. This entry was tagged desk accessory, desktop & office, office accessories, paperweight, paperweights, promotional merchandise, promotional office products, promotional products. Bookmark the permalink.